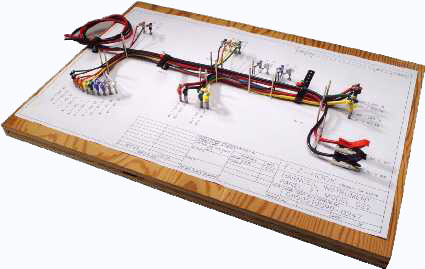 Need to test your wiring system? Want to create a clean, clutter-free, quick-disconnect assembly? We have the products you require to pretest circuits, components, and experimental hook-ups. E-Z-Hooks versatile terminal connectors hold wire in place for quick, sure anchoring or connection. This feature allows for fast and efficient harness board construction, saving development time and money. E-Z-Nailclips?and harness board nails drive into wood like a nail or can be used in predrilled holes and breadboards with adapters. Simple fingertip operation and ease of soldering eliminates set-up hassles and allows for more efficient work. Harness board nails are available in various sizes, from 1.25" to 5" in length and with varying diameters. E-Z-Nailclip™ test terminals are ideal for holding wire ends firmly in place. The simple fingertip operation makes connections hassle-free. When your application calls for a clip connection that can adapt to your current connections, E-Z-Hook terminal clip adapters are the perfect choice. Select from our various nailclip and breadboarding kits, terminal boards, and accessories to complete your needs.